Everyone has heard of Lemon Balm. Lemon Balm is a member of the mint family or the Lamiaceae family. Given the right conditions, ample moisture and freedom to do as it pleases, it can become as invasive as most mints. In fact, in parts of the Northwest, it is increasingly being considered a pest. Unless you want a yard full of nothing but Lemon Balm, then we suggest growing it in a wide container. We do find that trimming OFTEN during the growing season provides the best quality fresh Lemon Balm. And, this also helps to keep the plant from seeding and spreading. The seeds are numerous and very viable. Harvesting for drying can be done any time before flowering. Lemon Balm's delicate flavor diminishes even further when dried. Take care not to bruise the cuttings and hang in a dry place. Any moisture present during drying can cause the Lemon Balm stems to rot. 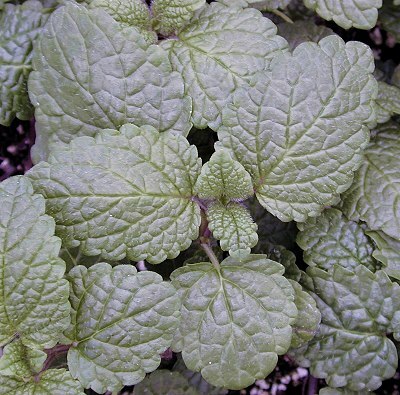 Not a particularly gorgeous herb, Lemon Balm does make a nice dark green ground cover with stems that rise during flowering to about 18 inches. The flowers are pretty ho hum, but the bees like them. Today we know Melissa officinalis as Lemon Balm but there was a time it was called Bee Balm. In fact the Greeks, who noted the affinity of bees for the plant, called it melisphylla or the bee plant. Today we use the common term Bee Balm to refer to Monarda didyma, also a favorite of bees. According to Stearn's Dictionary of Plant Names for Gardeners, Melissa is also the name of a Cretan Princess who first discovered how to get honey. Great for the bees, but, as we mentioned, Lemon Balm is really only a so-so culinary herb. There is some lemon taste when fresh, but not much and there is even less when dried. This is probably why most recipes that have Lemon Balm as an ingredient also call for lemon juice. So why is Lemon Balm so famous! For centuries, Lemon Balm was highly prized for making a healthy cordial known as Eau de Carmes (named after the Carmelite Friars who invented it). To make this the brothers would take lots of Lemon Balm leaves, that they bruised, and combined them with lemons, other herbs like Angelica and spices like cloves and then steeped the whole batch in alcohol. It was highly prized for stomach ailments. Lemon Balm (along with about 26 other ingredients) is still used in the liqueur Benedictine which is used as an after dinner digestif. Lemon Balm is also reported to be one of the 130 herbs that make the liqueur Chartreuse which again was originally made to be a health giving tonic. In Herbal Healing for Women, Rosemary Gladstar recommends Lemon Balm and Chamomile tea as the perfect way to relax after a stressful day. She also suggests these for headaches, depression and insomnia. For pregnant women, she advises Lemon Balm as a non toxic tea for allergy sufferers. Here is an excellent online link that points out the great contributions Lemon Balm makes to the world. These plants are sometimes available in plug trays. These trays hold 128 of all the same plant. They are a great low cost way to fill a lot of space. Each cell is 3/4 of inch by an inch. Check here to see if Lemon Balm Plug Trays are available. Lemon Balm makes a great addition to our Zone 5-11 Fragrant Herb Garden Six Pack.